This application is still in development, but I think would be a great way to get students interested in physics and physical science. (PS - You might want to mute the cheesy music). Jeff Jarvis at BuzzMachine has an interesting post describing an idea I've heard others articulate - building a course by finding and aggregating exemplary content from all over the web. Jarvis's idea, which is more expansive, is Google U or Google University. His idea is not just a distributed course or curriculum, but a distributed university. The most telling of his comments are that the Internet disaggregates ruthlessly and is unforgiving of of the need or desire to preserve old models and methods and in response, education needs to figure out how to become less of an institution and more of a platform. As educators, we really need to think seriously about how the Internet will re-shape what we do and figure out a way to respond. No one likes change, but it's much easier to embrace and lead the change than to watch it happening around you and end up like the dinosaurs - you can see them at the Natural History Museum. I wonder what the distributed university will look like. For that matter, I wonder what the distributed education will look like. It’s not an idle curiosity. Like media and every industry and institution before it, the academe is waiting to be exploded by the internet. Why should my son or daughter have to pick a single college and with it only the teachers and courses offered there? Online, they should be able to take most any course anywhere. Indeed, schools from MIT to Stanford are now offering their curricula the internet. Of course, these come without the benefit of the instructors’ attention — and without tuition — but it’s easy to add that interaction; there are lots of online courses taught by live faculty. Similarly, why should a professor pick just from the students accepted at his or her school? Online, the best can pick from the best, cutting out the middleman of university admissions. Now the next step: students teaching each other... students can self-organize with teachers and fellow students to learn what they want how and where they want. [and] ... could finally lead to the lifelong education we keep nattering about but do little to actually support. ... why don’t we? Because it doesn’t fit into the degree structure. And because self-organizing classes and education could cut academic institutions out of the their exclusive role in education. So what if the degree structure is outmoded? What does a bachelor’s of arts really say you’re ready to do? If education ends up handled by the Phoenix Universities of the web, then what happens to scholarship? The problem here is that the internet is unforgiving of needs to preserve old models and methods. It disaggregates ruthlessly. So I think that education has a rude shocking coming unless it gets ahead of this change and figures out how to become less of an institution and more of a platform. So what does the distributed university look like? RSS is a really great tool for keeping up on news, unfortunately not many people understand it or know how to use it. Here's more info to get you started with RSS. First is the wikipedia entry for RSS. Next is Common Craft's great video explaining RSS. Also a video from NCTT -The National Center for Telecommunications Technologies - demonstrating how to use RSS. And finally, from MakeUseOf - 14 “OTHER” Ways to Use RSS Feeds. (1)SendMeRSS - A great alternative to feed readers or aggregators - especially for those whose daily workflow is centered on email. (2) MailBucket - takes the complete opposite approach, generating an RSS feed from you email and sending your email to an RSS reader. CAUTION: This approach is not for the security. (3) TwitterFeed - I love twitter and have been using it for some time. Twitterfeed - takes content from RSS feeds and sends the content as updates to twitter. Here's a twitter feed for my blog. You can just follow this twitter account and get any new blog postings in yout twitter updates - pretty cool. (4) Pingie - Feed updates via SMS - great for the iPhone. (5) FeedJournal - If RSS and email are too techy for you and you prefer your news on paper, this might be your solution. Subscribe to RSS feeds and FeedJournal converts the content to a printable newspaper. (6) Wigitize - A widget service that allows you to add RSS content to your website. Also consider SpringWidgets. (7) ReminderFeed - Use your feed reader as a reminder service. (8) TagMindr - Also a reminder service, but also you to add web links - sort of an feed reader with del.icio.us functionality. (9) FeedBlendr / FeeDoor - Combine RSS and Atom, video, audio and text feeds into one. (10) FeedCrier - Feed updates in your chat program (AIM , MSN Messenger, Jabber and GoogleTalk). (11) ZapTXT -Monitor feeds for keywords. For instance, "Microsoft, Yahoo" to keep up-t0-date on the latest merger/takeover news. (12) SpokenText - Don't have time to read? 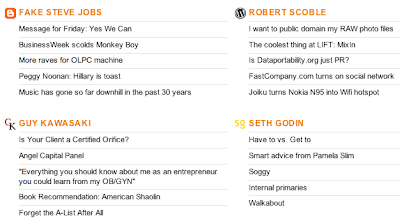 SpokenText converts RSS feeds to speech and allows you to subscribe to them as iTunes podcasts. Again, pretty cool! (13) RSSMixer - Merge multiple feeds into one master feed and accessible from any feed reader. (14) AideRSS - This is your RSS-assistant. Takes your hundreds and thousands of stories waiting to be read and applies a filter, leaving only the most popular stories. Sort of like your personal digg. I'm a big fan of online apps. I use Google Docs - Documents and Spreadsheets - quite a bit. Unfortunately, I rarely use the Presentation app, because you can't - yet - export from the app to a PowerPoint file. For sharing presentations, nothing works as well as slideshare - which I've referred to as the YouTube of PowerPoint. Others that I've used include: AjaxPresents - which I found to be sluggish, ThinkFree - which is one of the view that has online, desktop, and portable version, and finally, ZohoShow - which is a more full-featured PowerPoint replacement than Google Docs. Here is a more comprehensive list of PowerPoint alternatives that Mashable has compiled - 13 Online Presentation Apps. Whether you're a student, a teacher, or work in business, you'll be called upon to give a presentation. In fact, public speaking is an important basic skill that we all need, no matter what the situation - selling a product, an idea or yourself. Here are a couple resources to help get you thinking abut how you present and - hopefully - improve your presentations. The first is a 1999 presentation from MIT Professor Patrick Winston. In the presentation, delivered every year during MIT’s Independent Activities Period, Winston provides a set of speaking heuristics that he has developed and refined over his career. The video is a bit long at 50-minutes, but gives some really simple and useful techniques. Following the video is Ian McKenzie's brief description of the four types of speeches most people will typically encounter. Informative – This speech serves to provide interesting and useful information to your audience. Demonstrative Speeches – This has many similarities with an informative speech. A demonstrative speech also teaches you something. The main difference lies in including a demonstration of how to do the thing you’re teaching. Persuasive – A persuasive speech works to convince people to change in some way: they think, the way they do something, or to start doing something that they are not currently doing. Entertaining — The after-dinner speech is a typical example of an entertaining speech. The speaker provides pleasure and enjoyment that make the audience laugh or identify with anecdotal information. Here's a presentation Merlin Mann from 43 Folders gave at Macworld 2008 called "Living with Data: Attention Sinks and Time Burglars." From Captain Crunch and Phone Phreaks to Woz, Homebrew, and Gates to Mitnick, WarGames, and the modern hacker. Great 50-minute video from the discovery channel that traces the origins and evolution of hacking. A video I posted last August, showed Dean Kamen talking about the work his company was doing creating the next-generation prosthetic arm for Iraq War veterans missing either one arm or two (bi-lateral amputees). According to IEEE Spectrum, work on the Luke Arm - as Kamen has named it - is progressing quickly, and may soon be ready for clinical trials. Here's a video from IEEE Spectrum showing the latest prototype in action. Esther Dyson leading a 30-minute panel discussion on social networking from Google's Zeitgeist '07. Dan Benjamin at Hivelogic posted a great list of podcasting hardware and software - from entry level to prosumer/high-end. Unfortunately he only focuses on Mac OS X software. If you work on a PC, you might consider using the open source Audacity and explore Podcasting Tools to find more resources. If you’d rather not buy the whole setup, you can buy the C01U microphone all by itself for $85. The mobile market is wide open in ways that the desktop market is not. in the mobile world, Flash is rare, not ubiquitous. 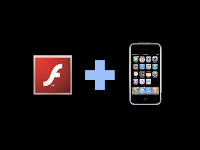 Why would Apple help Adobe establish Flash as a de facto standard for the mobile web, too? If Flash does turn into a major force in the mobile world, Apple can always add it later. But why shouldn’t Apple push for a Flash-free mobile web future now? From Google Video, here's a really fascinating documentary - Revolution OS - from 2001. It's lengthy at 1 hour and 25 minutes, but worth the time. If you have some free time this weekend, give it a look. Even better, download it to your iPod or iPhone and watch pieces of it anywhere and anytime you get a chance. If you have kids or students that are interested in computers or programming, point them to the video - I think they'll learn something! The documentary traces traces the history of GNU, Linux, and the open source and free software movements. The video includes interviews with several of the prominent contributors. In the first 10 minutes, it's particularly interesting to see and hear Bill Gates's Open Letter to Hobbyists. In the letter, he asks Computer Hobbyists to not share, but to buy software. Q: What's the "killer app" for Linux? A: The Apache web server! GOOD Magazine has a story about a really innovative method for environmental monitoring. The story describes the River Glow project. Architectural firm The Living and Eric Forman (not Eric from That 70's Show). 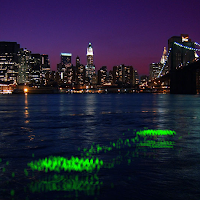 River Glow is a network of lights floating on the East River that provides quick visual feedback regarding the environmental health of the river. 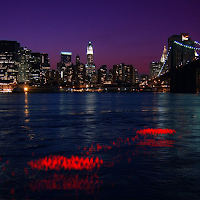 A pH sensor, powered by solar panels, monitors the acidity of the water, causing the lights to glow green when the river is healthy (low acidity) and red when the water is unhealthy (high acidity). R.E.M. today released 11 videos for the first song from their forthcoming album, all in MP4 format in HD and under an open source license. 'Supernatural Serious,' is the first single from the band's next album, 'Accelerate,' due to be released April 1st. Viewers are encouraged to remix the videos and share them on the song's YouTube page. Very interesting approach - a twist on what has been tried by Radiohead and NineInchNails Trent Reznor. I'm fascinated by this idea - imagine taking content from MIT OpenCourseWare and Open Yale courses and remixing them to create your own custom course. What could our students do, if we let them remix our courses? JiWire Wi-Fi Finder: JiWire locates wireless hotspots around the world. Glide Mobile: Glide is an online office and collaboration suite that allows users to create, edit, and share all kinds of documents including word processing documents, websites, photos, contact lists, calendars and more. Google Docs and iZoho offer similar capabilities (although read-only). Gas.app: Gas.app lets you find the gas stations with the lowest price anywhere in the US. A great companion to Gas.app is iPhone Miles, which is an easy-to-use mileage tracker. Movies.app: Movies.app lets you browse all movies showing in all theaters in your area on a specific date. Movies.app integrates with Maps for location information and also links to trailers and IMDb information for each movie. It even lets you buy tickets online via MovieTickets.com. Google Mobile: Google’s Web-based tools including Gmail, Google Docs, Google Calendar, Google Reader, Google Notebook, Picassa, and more. iPhlickr: iPhlickr - a simple and streamlined iPhone interface to photo-sharing site Flickr. Listingly: Listingly is an online list manager. Social Networking: Facebook, Multiply, and Twitter (via Pocket Tweets or Thin Cloud) are all traditional social networking sites that have dedicated iPhone application access. There are also new social networking sites designed specifically for iPhone users, including iRovr, iPling, and iPhone Colony. 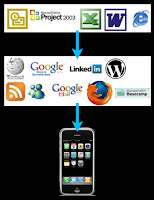 Visit Apple’s web apps directory to find more iPhone applications. Video has become a really great tool for engaging students and teaching and learning in general. In fact, I've found a number of videos for my networking courses at YouTube and Google Video. Unfortunately, you often have to wade through a bunch of unrelated videos and videos that just don't work for teaching and learning. For example, a search for networking usually gives me videos related to Social Networking (MySpace, Facebook, etc). Fortunately, Mashable has posted a list of over twenty links to sites with tutorial videos. Read more at 20+ Great Resources For Video Tutorials. If you use any other sites, please post in the comments and I'll share with everyone. If you're playing cards in any gambling game for over 20 minutes and have not figured out who the patsy at the table is, then it's you. If you teach for a living and you haven't figured out who the worst teacher is in the department, then it's you. Please come up with your own and post in the comments. If you have others that you like, please post in the comments. 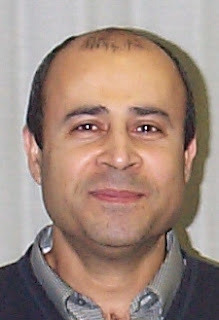 My colleague Mohammad is an electrical engineer. I'm a mechanical engineer. We often find ourselves in the office having discussions about our "million dollar ideas" - ideas for products or services that will make us a million dollars and allow us to retire early. One of my ideas - that Mohammad shot down - was a battery in your shoe that would charge as you walked. I figured this would be a great, inexpensive way to always have extra juice for your mobile gadgets - cell phone, ipod, iphone, even laptop. I didn't do anything with my idea - except share it with a few friends, but it looks like some researchers in Canada have built a prototype similar to what I describe - a little higher on the leg though. From Wireless Tech: New Knee Device Can Juice Up Your Mobile Gear. According to an article in this month's Science Journal, researchers at Simon Frasier University in British Columbia have developed a new technology to generate electricity from the natural motion of walking. Assistant professor of kinesiology Max Donelan and other team members say their biomechanical energy harvester promises to revolutionize the way people charge the batteries that power all sorts of mobile devices, like laptops, cell phones, and emergency rescue gear. The energy harvester, which straps across a knee joint just like an athletic knee brace, can generate up to five watts of electricity with little physical effort. And one minute of brisk walking can generate 13 watts -- enough to support 30 minutes of cell-phone use. Add this one to your web office toolkit - LiquidPlanner is an online, hosted project management tool that lets you access and update projects anywhere you have an internet connection. The service offers you and your team a complete project environment, social networking and collaboration features, and a probabilistic scheduling engine which tells you the probability of completing each task - and ultimately the entire project – by a certain date. With everything organized into a centralized dashboard that can be customized for each team member, everyone on your team can stay focused on their tasks and how they relate to the project as a whole. LiquidPlanner's three main areas of focus are task management, scheduling, and collaboration, all of which combined help you estimate your timelines and update progress on a project in a way that is customized for you. Liquid Planner is free during its beta period, which is occurring now. Afterwards, it will remain free for a single users, but teams of two or more will need to pay a monthly subscription fee. Though this year's show had been widely seen as the global launching pad for the Internet giant's mobile developer platform, Android, the few handset prototypes on display from chipmakers ARM, Qualcomm (nasdaq: QCOM - news - people ) and Texas Instruments (nyse: TXN - news - people ) lack sophistication. ARM's model resembles a plain, clunky smart phone. Qualcomm's is an ungainly mélange of circuit boards and screens. TI's boasts a large screen full of square icons for one-click access to messaging, videos, lists and maps. All are somewhat speculative test models, however, as Google (nasdaq: GOOG - news - people ) hasn't yet released specifications for Android phones. Nevertheless, a Google representative at the show confirmed that Android handsets will hit the market in the second half of the year as planned. Perhaps Google should hire Apple's Jonathan Ive - designer of the iPod, iPhone, etc. AIM Pro - A business class version of AOL Instant Messenger (AIM). 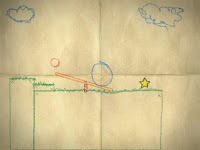 Eyejot.com - Web-based video recorder. KonoLive.com - Business class IM. Skype For Business - Includes a business control panel. 12Planet.com - Secure instant messaging on an intranet, or a Virtual Private Network (VPN). Avaya.com - Allows interaction with Provides solutions for customer interactions, remote offices and mobile workers. Huddle.net - Allows team members to set up a profile, invite Facebook friends, and collaborate with one another. LanTalk.net - A full featured instant messaging solution. Novell GroupWise - Mobile collaboration, communication and instant messaging. WebEx.com - web conferencing software. we’ve just got word from a reliable source that Flash support is on its way to the iPhone, and it should be coming very, very soon. 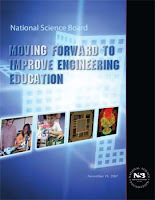 Changes in the global environment require changes in engineering education. Markets, companies, and supply chains have become much more international and engineering services are often sourced to the countries that can provide the best value. Basic engineering skills (such as knowledge of the engineering fundamentals) have become commodities that can be provided by lower cost engineers in many countries, and some engineering jobs traditionally done in the U.S. are increasingly done overseas. To respond to this changing context, U.S. engineers need new skill sets not easily replicated by low-wage overseas engineers. Society at large does not have an accurate perception of the nature of engineering. Survey data indicate that the public associates engineers with economic growth and defense, but less so with improving health, the quality of life, and the environment. The third challenge for engineering education is to retain those students who are initially attracted to engineering. Attrition is substantial in engineering, particularly in the first year of college. About 60 percent of students who enter engineering majors obtain a degree within 6 years. Although this retention rate is comparable to some other fields, it is especially critical for engineering to retain the pool of entering students. The first point speaks to the increasing globalization of our economy and the challenges of off-shoring. Number two and three are particularly daunting. It's very true that the general public doesn't understand what an engineer is or does. Lastly, is student retention. Our engineering students are among the best at each of our institutions. They have to be, because engineering is such a difficult field. Unfortunately, this inherent difficulty results in lower enrollments, greater attrition, under-prepared students, and losing students to less demanding disciplines. How should we respond to these challenges? Unfortunately, there is no silver bullet, but we (educators and engineers) can do a better job. Let's begin with globalization. Here, the genie is out of the bottle and there's no way we're getting it back in. Instead we have to better prepare our students and future engineers to innovate and compete in a global environment. This includes an appreciation that the US is no longer at the center of the universe, we are just one of many. Innovation has always been the hallmark of US engineers and we should strive to continue that tradition. This is a challenge given the shrinking pipeline of US engineering students. Addressing two and three above - filling the pipeline - is an important first step in making our engineers more innovative and thus more competitive. Now on to two. At conferences, engineers always opine over the fact that we don't have a TV show focused on engineering - a MacGyver. Consider, for example, the huge spike in enrollments that our Criminal Justice programs are seeing. Some of this has to be attributable to the interest and excitement generated by the proliferation of CSI and CSI-like shows. Unfortunately, there's not much we can do here. What we can do is be more visible - as educators and engineers - in our communities. At PTA and town hall meetings, at boys and girls clubs, at elementary, middle and high schools, even at professional organization and chamber of commerce meetings. We have to make opportunities to "educate" the public - students, teacher, parents, counselors, and business-people. They need to know what an engineer is, what an engineer does, and more importantly what it takes to become and be an engineer. Number three may be the most challenging. We can't make engineering "easier" or less demanding, it is what it is. Instead, we have to do a better job of preparing our students to study engineering. Addressing number two helps, but we need to help our K-12 teachers do a better job of preparing our students. Project Lead the Way endeavors to do just that. I'm not aware of any data suggesting that PLTW has had any succes at increasing college engineering enrollments, but this is not something that is going be apparent in the short-term. Some schools are trying out summer math prep camps, and building strong support services for engineering students. I think it's important look at what people are trying and build on those models that work. We also need to be open to new ideas, such as counseling some students from engineering into careers as technician and technologists. Another idea is to build a strong pre-engineering programs in our schools and use these to fill the engineering pipeline - it seems to work for the nursing programs at our schools. Lastly, we have to be willing to roll up our sleeves, get out there to recruit new students, connect better with current students and - I think most importantly - open our minds to new approaches to teaching and learning. If you haven't Mike Beauchamp's story - which is making it's way around the web - here are the pictures from his flickr photostream and a portion of the story. Much to my surprise, as I approached, I heard the familiar sound of my ringtone -- the iPhone was alive and ringing! As I picked it up and cradled it gently in my hands, I saw the screen displaying my caller ID -- the screen still worked! I slid my finger gently over the answer slide and paused as I held the tattered and torn device to my ear -- my heart must have skipped a beat when I heard my mom's voice at the other end of the phone -- the phone still worked! I ran back to my car and sat on the side of the road for about 15 minutes inspecting it, testing it, and looking it over -- how in the hell had it survived being trounced by an 18-wheeler at 70mph?!? Interesting take on Microsoft hostile takeover of Yahoo. Microsoft lost nearly $40 billion in market cap in the eight trading days since they made their offer. Microsoft has shrunk by a Yahoo in the last eight days. the tool of choice to enable continuous partial attention is a mobile device, not a laptop. To my surprise, roughly 80% of my Money:Tech rowmates had iPhones in hand. I expected New Yorkers to be a Blackberry crowd, but it looks like Tim was on to something when he predicted that the iPhone will beat the Blackberry. I've written a number of posts about RSS - Really Simple Syndication - and how useful it is for keeping track of news, people, etc. Unfortunately, I've come to realize that most are unaware of RSS, much less use it one a regular basis. You and I both know that anyone not using RSS is missing out. Even worse, organizations that don't syndicate their content with RSS are missing out on a great opportunity to grow their business, their markets and their audience. Finance: Both Google Finance and Yahoo! Finance let you get finance news updates for specific companies and stocks, just look for orange "Subscribe" or "RSS" icons in your browser. To receive stock quotes (only for some stocks), you can use NASDAQ's feeds. Weather: You can get weather updates from The Weather Channel, WeatherBug, or NOAA's National Weather Service. Classifieds: As Gary mentioned, both craigslist and Oodle.com offer feeds for all of their listings. Just look for the orange "RSS" link at the bottom of any results page -- when you subscribe to a search, for, say, apartments under $1500 in Manhattan, you'll get updates when there are new apartments matching that search. Similarly, in eBay you can find an RSS link at the bottom of any search page, and in Google Base near the top-right corner. Package tracking: If you'd like to track packages that have been sent by UPS, FedEx, USPS or DHL/Airborne, you can use isnoop.net's universal package tracking or simpletracking.com. Social networking: Facebook offers feeds for many of its features; you can see notifications, status updates, and your friends' posted items in Reader, as explained on this page. For those of you that are Twitter fans, you can get RSS feeds for many of its pages. Shopping: Amazon lets you get feeds for the latest popular products as well as wish lists (look for the orange feed icon). Many other shopping web sites offer feeds, including Yahoo! Shopping, MSN Shopping, and NexTag. Saved searches: Google Blog Search, Google News and most Yahoo! sites (among others) let you subscribe to search results as feeds. This way, if you want to monitor a topic, you don't have to keep running searches over and over again. What about an RSS reader or aggregator? There's a lot to choose from, including web-based apps you can use from any PC or downloadable applications that run on your PC. There's a great list of both at NewsOnFeeds.com. I prefer the web-based Google Reader. Whitney Hess - a Bloglines Beta user - does a great side-by-side comparison of Google Reader and Bloglines Beta. Whatever reader someone chooses, it should integrate well into their daily workflow. For your colleagues and friends uncomfortable with RSS, David Armano at Logic+Emotion point us to Alltop - a collection of top (popular) bloggers and their most recent posts - aggregated together on a single page. This is a great way to get someone interested in reading syndicated content and maybe eventually to using RSS. Using Pageflakes, you can even put together your own collection to share with your friends and colleagues. Here a collection on training and e-learning put together by Karl Kapp and Steve Woodruff. It's time to discover your inner RSS Evangelist! Scientific American's 60-second science has a bi-weekly series called Instant Egghead - wish I thought of the name. Instant Egghead endeavors to explain complicated science and technology - often cutting edge topics - in easy to understand terms. And even better, in two minutes or less. The following video explains quantum computing. Read more about the emerging fields of quantum computing and quantum cryptography at wikipedia. If you're not in education, you're probably not familiar with the terms CMS or LMS. These terms are acronyms for Course or Learning Management Systems. There are a number of options available, including commercial and open-source L/CMSs. I'm not going to get into the specifics of what these packages do or compare one versus another, instead I encourage you to read a great wikipedia entry on LMSs. Until recently, my college was using the WebCT LMS. WebCT and competitor Blackboard have been the dominant commercial LMS applications, until roughly two years ago when Blackboard purchased WebCT. With this consolidation, our college and many other colleges were faced with three choices (1) stay with WebCT until Blackboard merged the two products, (2) convert to Blackboard, or (3) transition to an entirely different LMS - either commercial or open-source. We decided to migrate our online, hybrid, and web-enhanced courses to Angel - a smaller, commercial alternative to Blackboard. After running a pilot in the Fall of 2006, we began training our faculty in Angel and moved all of our courses into Angel in the Spring of 2007. Other than some issues with conversion of courses from WebCT to Angel, the transition has been very successful and well-received by the faculty. It's likely that we would have had similar issues moving to Blackboard or even a newer version of WebCT. One of the great things about Angel is the size and responsiveness of the company. AngelLearning is a relatively small company - especially compared to Blackboard - and as such has been very open to user feedback and quick to respond to any issues or problems we have encountered. Reading this blog, you know how much I value many of the Web 2.0 tools, including blogs, wikis, podcasts and RSS content syndication. I and others have requested the integration of these tools into Angel. In fact, I have been advocating that every LMS should support Web 2.0 tools. It's great to see that AngelLearning has taken this feedback to heart. We are currently testing Angel version 7.2 on a closed network inside the college. As you can see from the screen capture below, Angel 7.2 now allows an instructor to create a wiki or blog page and to create a folder to store and syndicate content. This is a tremendous move forward in the evolution of the LMS and will allow for greater student involvement, interaction and engagement. I'm not sure where others (Blackboard, Desire2Learn, WebCT, Moodle, Saki, etc) are with regard to Web 2.0, but it's great to see Angel taking such a big step forward. Great presentation by Mike Sharples from slideshare. 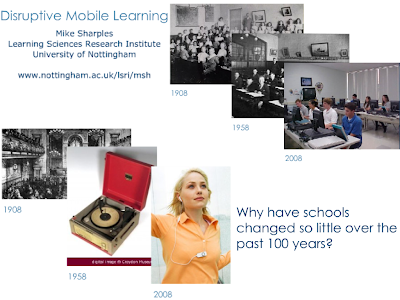 Consider the images below where Sharples contrasts the evolution of media devices (1908-1958-2008) versus classrooms from the same eras and wonders - Why have schools changed so little over the past 100 years? 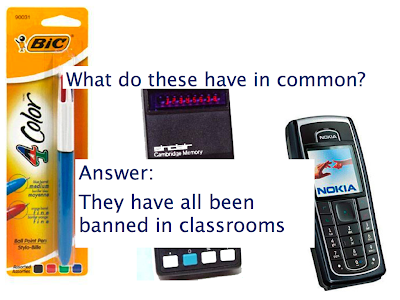 Considering recent devices that have been banned from schools - iPods and camera phones - makes some sense in light of what schools have banned in that past. See all the slides below. Self-described Enterprise 2.0 Evangelist Scott Gavin has posted a couple of great presentations - Meet Charlie and Charlie Goes Mobile - on slideshare. The presentations focus on Charlie - Mr. Enterprise 2.0 - and how Charlie has transformed the way he works, moving from traditional desktop apps - Outlook, Project, Excel, Word and IE, to web-based apps and services - Wikipedia, Google Docs and Spreadsheets, LinkedIn, Wordpress blog, RSS, MSN Messenger, GMail, Firefox, wikis and Basecamp. The first details this transformation and how it has effected his work, and his interaction with bosses, colleagues and mentors. Finally, in the second presentation Gavin has Charlie taking everything mobile. Charlie's favorite piece of software? Firefox! Very interesting presentations. Watch them, and give some thought to how you can begin to integrate some of these tools into your workflow and your organization. In response to todays' news of the potential Microsoft-Yahoo merger/buyout/takeover [I'm not sure which] Henry Blodget at the Silicon Alley Insider has created a spreadsheet detailing the combined financials for what some are calling Micro-Hoo. You can actually view their calculations here in Google Docs - ironic isn't it.